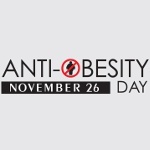 Anti-Obesity Day is an international observance held on November 26. It is organized by a group of healthcare organizations primarily in India and the Gulf Cooperation Countries states. The event aims to raise awareness of obesity as a public health hazard. Obesity is a medical condition in which excess body fat has accumulated to such an extent that it may cause serious health problems. Obesity reduces life expectancy and increases the likelihood of heart disease, diabetes, osteoarthritis, and other diseases. Obesity is considered one of the most serious public health problems of the present time. It is common in almost all regions of the world except sub-Saharan Africa. In 1997, the World Health Organization formally recognized obesity as a global epidemic. Obesity rates are raising most dramatically in urban settings. The first Anti-Obesity Day campaign was launched in 2001 by VLCC, an Indian wellness brand founded by Vandana Luthra. The campaign focused on promoting the development of good lifestyle habits to prevent obesity and stay fit and healthy. Anti-Obesity Day received wide media coverage and became an annual campaign. Anti-Obesity Day events organized by VLCC and its partners include mass counseling sessions, health camps, talk shows with leading health experts, media campaigns, educational events etc.